For many, it may come as a surprise to learn that several ancient peoples were seafarers. The ancient Egyptians, Babylonians, and Phoenicians, for example, are known to have sailed rivers and seas alike, while the stories of Odysseus and Sinbad seem to reflect real-life experiences to some extent. Indeed, the Book of Mormon records the migrations across the seas of three ancient groups of people from the ancient Near East to ancient America—the Jaredites, Lehites, and Mulekites (Ether 6; 1 Nephi 18:8; Omni 1:15–16). 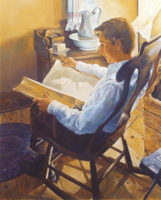 In each instance the text attributes the respective group’s safe passage to divine protection and guidance, highlighting one of the Book of Mormon’s central messages of relying on God in the face of great trials or uncertainties. In the past, claims of pre-Columbian transoceanic contact with the Americas were met with skepticism. With few exceptions, such as the Viking contact with coastal Canada during the 11th century AD or possible Polynesian contact with South America,[iv] many North American scholars dismiss such claims as outlandish and lacking any concrete historical or archaeological evidence. While this skeptical paradigm has remained dominant in many academic circles, scholars in growing numbers have argued for extensive pre-Columbian transoceanic contacts. John L. Sorenson is one such scholar whose lifelong work on pre-Columbian transoceanic contact has appeared in reputable Mormon and non-Mormon scholarly venues. [v] Besides arguing for transoceanic contact himself, Sorenson and Martin H. Raish have cataloged an extensive bibliography of non-Mormon academic work that argues, to varying degrees, for possible evidence of pre-Columbian transoceanic contact. [vi] “It is clear,” Sorenson and Raish maintained, “that the technological capacity for transoceanic voyaging has been available at a number of points in the Old World many times in the past. It is both plausible and probable on nautical grounds that numerous voyagers crossed the oceans at multiple points before the age of modern discovery.”[vii] Sorenson offers numerous biological evidence of transoceanic contacts as well as cultural parallels between peoples of the Old and New Worlds. In a letter written to Sorenson regarding his work on transoceanic contact, Coe said, “It’s an enormously impressive piece of scholarship,” and even went so far as to say, “So much of this evidence, I think, is irrefutable.”[ix] These comments show considerable respect within the academic community for Sorenson’s paradigm-shifting research. From what little is known about the ancient past, it appears that ancient people ventured out into the sea for many reasons. Some voyages were for commercial or political purposes. Other expeditions were for military conquest, as when the Greeks led by Agamemnon besieged Troy (c. 1100 BC), or when the Persians attempted to conquer Greece but were defeated in a sea battle at the Bay of Salamis (480 BC). Others, like Lehi’s group, set sail for new lands hoping to found colonies or fleeing from their enemies. Little is known about the construction of these ancient vessels. Perhaps the Large Plates of Nephi explained such details, but that record is not included in the Book of Mormon. Nephi’s Small Plates contained information of spiritual interest, and that explains why we are only told that the ship that carried Nephi and his family to the land of promise was constructed after a manner revealed to him by the Lord: “And it came to pass that the Lord spake unto me, saying: Thou shalt construct a ship, after the manner which I shall show thee, that I may carry thy people across these waters” (1 Nephi 17:8). Even though mocked by his brothers (1 Nephi 17:17–18), Nephi trusted the Lord and followed his instruction in building the ship. Nephi “did not work the timbers after the manner which was learned by men, neither did [he] build the ship after the manner of men; but did build it after the manner which the Lord had shown unto [him]” (1 Nephi 18:2). Evidence for ancient transoceanic contact and Jewish seafaring at least shows that the notion of pre-Columbian contact between the Old and New Worlds is not impossible. 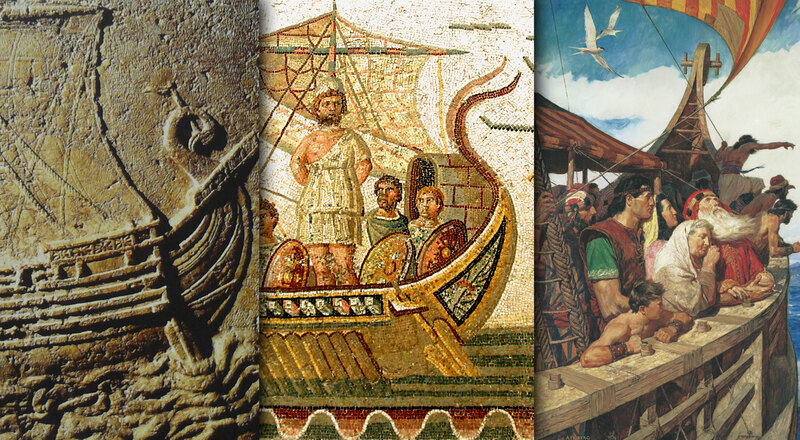 Still, even with the best of efforts, sea travel in ancient times must have been extremely risky. This explains several details in the scriptural accounts. The story of Jonah, set before the time of Lehi, reflects the near-catastrophe that must have befallen many ships (Jonah 1:4). Evil gods and violent forces were thought to rule the waters and the deeps, both in the Canaanite epics and in the Hebrew Psalms. In fear, sailors sought divine protection, and looked for the cause of any severe weather brought upon them (Jonah 1:7-10). Under similar conditions, Nephi feared exceedingly that his brothers’ “rudeness” and their forgetting God would cause the Lord to “be angry with us, and smite us because of our iniquity, that we should be swallowed up in the depths of the sea” (1 Nephi 18:10). Looking back on their harrowing journey, no wonder the only explanation they could give for their safe arrival in the land of promise was that nothing but the power of God could have delivered them (1 Nephi 18:20-21), and that “the mercies of God” alone had “spar[ed] their lives, that they were not swallowed up in the sea” (2 Nephi 1:2). Thus, in addition to being able to take encouragement from Nephi’s faith and determination in building the ship, we can now also appreciate that there is evidence that ancient people really did sail across the sea and reached distant lands. John L. Sorenson, Mormon’s Codex: An Ancient American Book (Provo: Neal A. Maxwell Institute for Religious Scholarship, 2013), 150–172. John L. Sorenson, “Ancient Voyages Across the Ocean to America: From ‘Impossible’ to ‘Certain’,” Journal of Book of Mormon Studies 14, no. 1 (2005): 4–17, 124–25. [i] Raphael Patai, The Children of Noah: Jewish Seafaring in Ancient Times (Princeton: Princeton University Press, 1998), 21. [ii] Patai, The Children of Noah, 19. [iii] Patai, The Children of Noah, 21. Patai refers readers to Latter-day Saint scholar John M. Lundquist’s appendix “Biblical Seafaring and the Book of Mormon,” 171–176, for a fuller treatment of the Book of Mormon’s depiction of ancient Jewish seafaring. [iv] See for example Marissa Fessenden, “Ancient Easter Islanders Likely Sailed Back And Forth to South America,” online at https://www.smithsonianmag.com/smart-news/ancient-easter-islanders-likely-sailed-back-and-forth-south-america-180953178/?no-ist (Accessed October 5, 2015). [v] See John L. Sorenson, “Some Mesoamerican Traditions of Immigration by Sea,” El México antiguo 8 (1955): 425–38; “The Significance of an Apparent Relationship between the Ancient Near East and Mesoamerica,” in Man Across the Sea: Problems of Pre-Columbian Contacts, ed. Carroll L. Riley et al. (Austin: University of Texas Press, 1971), 219–41; “Scientific Evidence for Pre-Columbian Transoceanic Voyages to and from the Americas,” Sino-Platonic Papers 133 (Philadelphia: Department of East Asian Languages and Civilizations, University of Pennsylvania, 2004); “Ancient Voyages Across the Ocean to America: From ‘Impossible’ to ‘Certain’,” Journal of Book of Mormon Studies 14, no. 1 (2005): 4–17, 124–25; John L. Sorenson and Carl L. Johannessen, “Biological Evidence for Pre-Columbian Transoceanic Voyages,” in Contact and Exchange in the Ancient World, ed. Victor H. Mair (Honolulu: University of Hawai’i Press, 2006), 238–97; John L. Sorenson and Carl L. Johannessen, World Trade and Biological Exchanges before 1492 (New York and Bloomington, IN: iUniverse, 2009); Mormon’s Codex: An Ancient American Book (Provo: Neal A. Maxwell Institute for Religious Scholarship, 2013), 150–172. [vi] John L. Sorenson and Martin H. Raish, Pre-Columbian Contact with the Americas Across the Oceans: An Annotated Bibliography, 2 volumes (Provo: FARMS, 1996). [vii] Sorenson and Raish, Pre-Columbian Contact with the Americas Across the Oceans, 1:xii. [viii] John Dehlin, “Dr. Michael Coe – An Outsider’s View of Book of Mormon Archaeology,” an interview with Michael Coe, Mormon Stories, August 12, 2011. Podcast available at https://mormonstories.org/?p=1880(accessed January 31, 2012). Podcast is broken down into three parts, the quoted portion is found in part two. Quotation based on a transcript of the interview prepared by volunteers for FairMormon. Coe goes on to say that Sorenson is a “real scholar,” but also expresses his view that the he is “looking in the wrong direction” and that the evidence supports contact between East Asia, but not the Middle East. While it is true that the vast majority of the evidence is for ties with East Asia, there is evidence connecting the Americas and the Middle East as well. See the articles by Sorenson cited in footnote 5 for more details. [ix] “‘Ask the Scholar’, John L. Sorenson edition (part 3 of 3),” Maxwell Institute Blog, February 21, 2014, at https://maxwellinstitute.byu.edu/ask-the-scholar-sorenson-3/ (accessed February 21, 2014).